Cruisers in Tonga discover freediving and are immediately hooked on the simple elegance of a healthy pastime. I’m floating in the electric-­blue water of Tonga’s Vava‘u group. My goal is relaxation. It shouldn’t be that hard here, 50 meters from the white shores of a tiny tropical paradise. Then again, I’m not floating on the surface, cocktail in hand. I am facedown, taking deep breaths through a snorkel in preparation for a 30-foot descent. I will hold my breath for nearly two minutes while the cheery island of ‘Eua’iki and its clacking coconut palms, thatched-roof fales and smells of lunch wound up in the breeze are left at the surface. I’ll need to focus, but I’ll also need to be calm as I descend into my brief underwater existence, where, if everything comes together, I’ll find myself suspended in another world. This is Day One of my freediving certification course, and I’m immediately hooked. Freediving is a pure form of sport, involving almost no equipment and an uncluttered mind. On a purely athletic level, it’ll whip you into shape if you take it seriously. For those of us who are keen to stay fit while cruising but are less than thrilled with the idea of downward dog on the foredeck every morning, freediving is the perfect practice. It also puts you on a more level playing field with fish, so when you select and spear your own dinner instead of reeling in whatever you happen to hook, you can truly say you worked for it. For me, it’s a combination of all these things. Tonga is an incredible place, and seemingly designed for learning the essentials of freediving. The numerous islands that make up the Vava‘u group have steep drop-offs, so divers can ease into deeper water as they progress rather than plunge immediately into the deep blue or, worse, have to be surrounded by the concrete walls, chlorine stench and fluorescent lighting of an indoor pool. The Vava‘u group also is perfectly set up for leisurely cruising. There are lots of sandy anchorages, protected bays and a lively little main harbor. No anchorage is more than a few hours’ sail from the next, so short trips between islands don’t require advanced planning. Sundowners and barbecues at picturesque anchorages happen all too frequently, which, if you’re like me, is dangerous to maintaining an ideal level of fitness. Until I began freediving, I only partook in two forms of exercise while living aboard: grinding winches and walking long distances, carrying as many overstuffed grocery bags as each shoulder could bear. And I was attending happy hour more often than I care to admit. I badly missed running — the challenge of it, the way my body had to work in sync, the feelings of accomplishment and pride at having pushed myself after a tough session, and the lucidity that came after a long run. I missed needing only a pair of shoes to get a glimpse of the outdoors. Freediving relit that athletic flame for me. 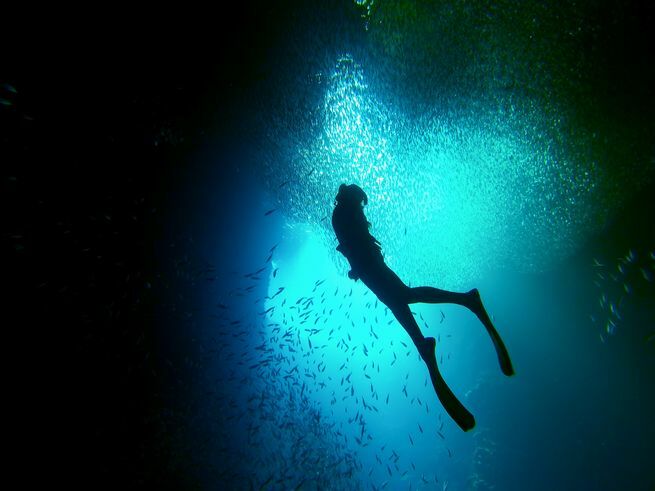 Unlike scuba, I didn’t need a bulky buoyancy compensator or oxygen tank to re-establish my connection with nature, and as I progressed, the psychological aspect of the sport became more significant too. I began paying more attention to the daily influences on my state of mind and the minute patterns in my breathing. I paid close attention to my diet. With practice, I was not only able to dive deeper and hold my breath longer, but I began to feel stronger, more agile, and to regain the mental clarity that I’d felt I’d lost along with regular cardio exercise. Why, as someone who spends every day on the water, it took me so long to discover this sport, I’m not sure. But when I found myself 30 feet below, focused but calm, physically challenged and mentally aware, I knew I would continue. For a brief moment, blueness and silence enveloped me. Then my diaphragm began contracting, a signal that it was time to ascend. The fish that had scattered at first encounter now swam near me, curiosity prevailing over fear. To my left, the sandbank rose gently toward where I’d watched from shore earlier as a school of baitfish moved as one unit, hunted by cunning needlefish. To my right, nothing but depthless blue. Whales sang in the distance. Time melted. I felt nowhere and everywhere all at once. I was a world away, just like I’d set out to be.